The 'Mario Kart Love Song' Now In New, Improved MP3 Format! Remember mustachioed singer-songwriter Sam Hart's lovely Mario Kart-themed ballad? Of course you do. It made grown men weep and girly knees weak—and now you can buy it, like a good person of the internet. 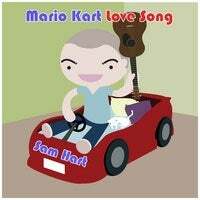 Mr. Hart has, at the behest of his trusted circle of friends, recorded his original "Mario Kart Love Song" all professional-like and made it available via iTunes and CD Baby. It's generously priced at the MP3 standard of 99 cents, American, should you have the urge to plop it onto your Zune and feel all fuzzily romantic. Haha! Just kidding. No one has a Zune. Go on, support your fellow Mario Kart nerds. Give a little!